Florence is a beautiful city. There’s no denying it; stand anywhere, look to the right or left, and you’re very likely to find a centuries-old statue looking back at you. It seemed that every street ended at a colorful piazza, another delicious trattoria, or a museum full of timeless artwork. There’s enough to do there to fill weeks, even months. So it felt almost nonsensical when, just a day after touching down in Florence, we planned a day trip to get out of the city. 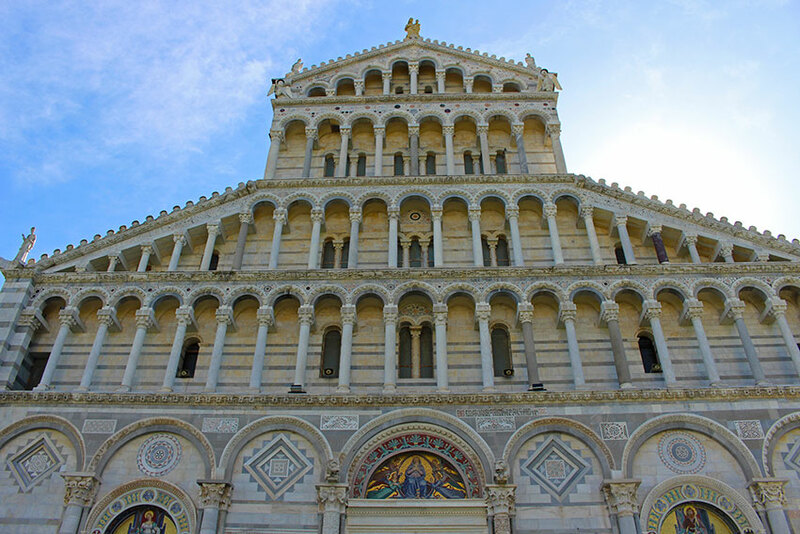 The Piazza del Duomo would wait for us; our first day in Italy would instead be spent in Pisa and Cinque Terre. Early on our first morning, Adam and I woke up, shook off the last shreds of our jet lag, and made the quick journey from our hotel to Firenze Santa Maria Novella, the main train station and our jumping off point to parts west and north of the city. Just 10 minutes later we had purchased a ticket, boarded a train for Pisa, and were watching as Florence started to disappear into the distance through the window. Pisa is a quick trip from Florence- just about an hour depending on the train you select and the number of stops it will make, but finding a direct train is very easy and provides you with multiple options. We didn’t pre-book our tickets- that isn’t necessary for regional trains- so we walked into the station, purchased them at a kiosk, found our desired train at its assigned track, picked seats, and sat back for the journey. 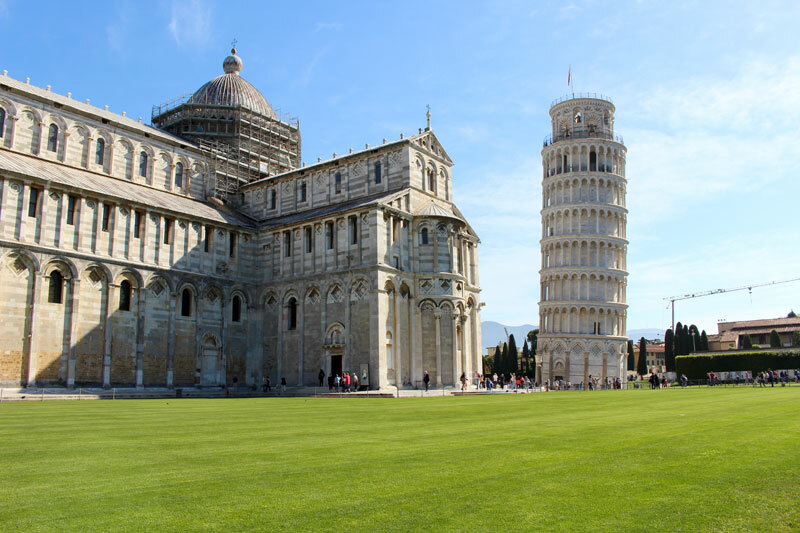 We put Pisa on our itinerary for one reason, the main reason it winds up in so many traveler’s plans: we wanted to see the famous leaning tower. It has always been on my bucket list, honestly, just because it’s famous. Everyone has seen it. Everyone has the requisite photo where they look like they are propping it up. I felt like a bad world traveller when I would shake my head and say I had never been. Like the Eiffel Tower, Big Ben, or the Statue of Liberty, it just felt like something I should see in my lifetime. 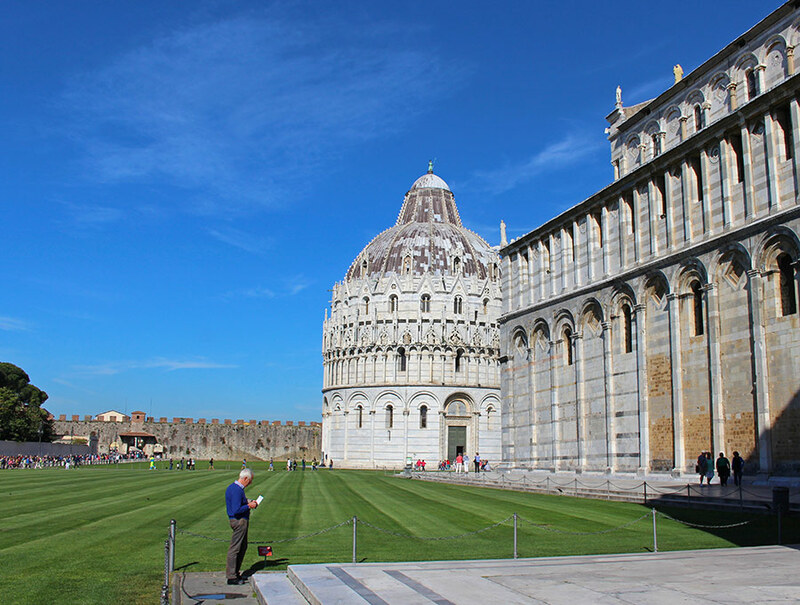 When our train pulled into Pisa Centrale, we followed the winding streets in what we figured was the right direction. It’s about a 20 minute walk from the station to the tower, and the streets aren’t marked well (granted, I was hoping for signs with tilted tower icons and arrows; if you can read Italian I’m sure it’s much easier to navigate- look for signs to Piazza dei Miracoli). After crossing the Arno River and continuing onward we finally paused to consult Google Maps. As I tried to find a wifi signal, Adam pointed to the left. “I’m guessing that might be it?” he asked. A large tower tilted to the left in the distance. “As long as only one tower leans in this town, I think we’re OK without the map,” I said. A few short blocks later we were standing in front of one of the most famous landmarks in the world. The Leaning Tower of Pisa is beautiful, and it’s impressive. Over the course of thirty minutes we took a lot of photos from just about every angle, and then we hung back and took in the scene. The tourists were arriving in full force. We watched as people posed in all sorts of uncomfortable positions to secure the ultimate souvenir: a photo holding up the Leaning Tower of Pisa. Lines were forming for a chance to climb the tower. We smiled at each other and decided it was time to move on to our next stop for the day. 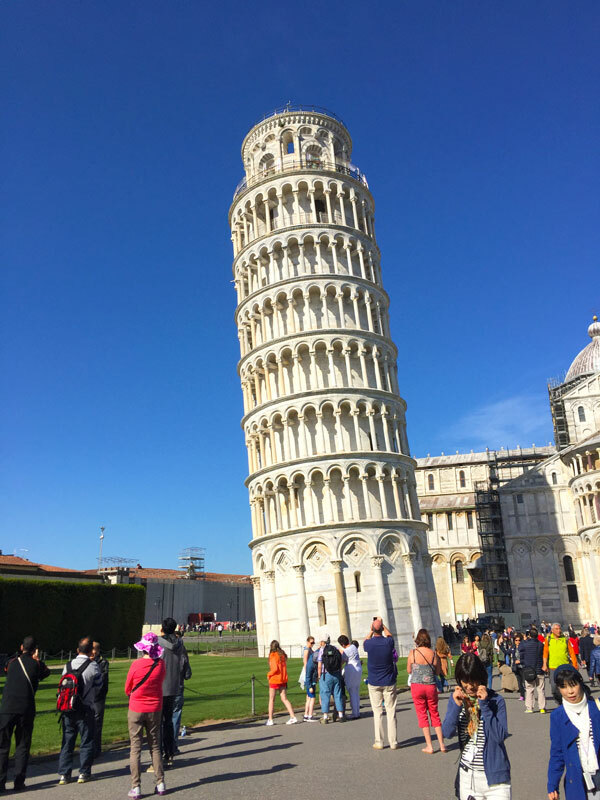 Seeing the Leaning Tower of Pisa was without a doubt wonderful to cross off our bucket list, but somehow we didn’t need to spend more than an hour there. We had seen what we wanted to see, and that was enough. Interestingly, when talking with friends who had visited the tower before us, many shared that they also limited their time there. In retrospect, there is much more to do in Pisa than just see the leaning tower, and we didn’t do any of it. 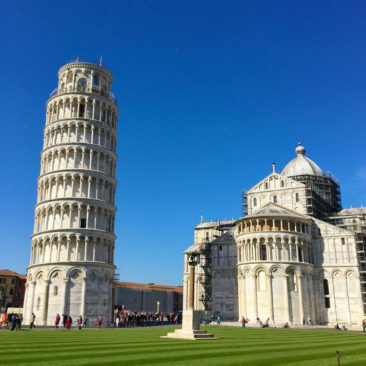 With more free time that day we would have explored the town and the other beautiful and historic buildings that share the Piazza dei Miracoli. Many people make a full or half day out of their visit to Pisa, and given another opportunity we would likely do the same. That being said, we arrived fairly early in the day; it was around 9 in the morning when we got to Pisa Centrale and just after 9:15 when we arrived at the tower. It was easy for us to enjoy the sights and get some photos before we were overwhelmed by the throngs of other tourists. Also, there were very few vendors peddling their wares or open shops at that time, which made for a less hectic experience for us when we first arrived. If you’re thinking of visiting, consider the early part of the day to avoid some of the crowds. 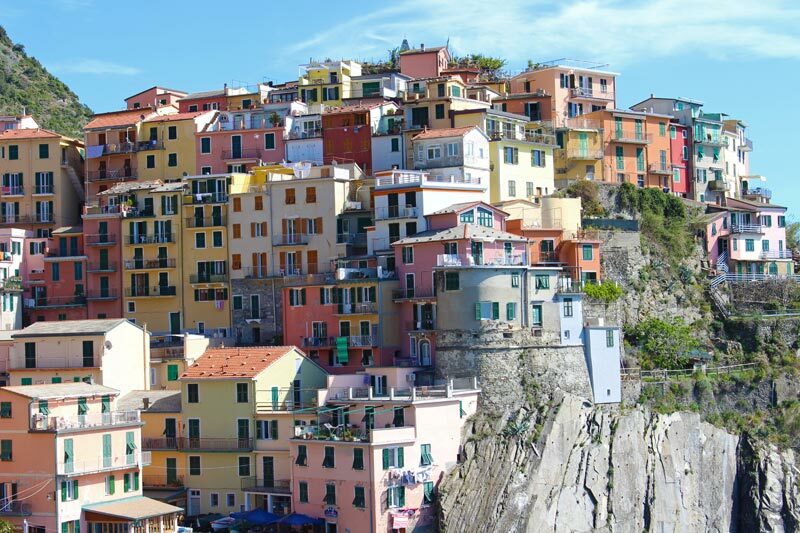 By 11:00am we were on another train, and after a one hour ride and a quick transfer we found ourselves in Manarola, one of the five towns that make up beautiful Cinque Terre. 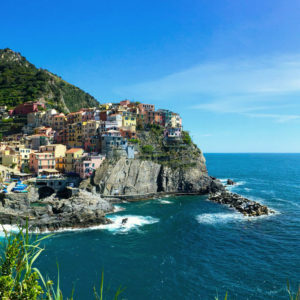 Ever since Rick Steves recommended travelers visit Cinque Terre as part of their tours of Tuscany, the brightly colored houses and turquoise waters that dot Italy’s coast have been an enormously popular attraction. It’s hard to argue with the endorsement; every photo we saw and description we read was more enticing than the last. Despite the fact we only had an afternoon at Cinque Terre, we didn’t want to miss the chance to see it for ourselves. We arrived in Manarola with no agenda except to take in the sights and the landscapes- and, ideally, find something to eat. 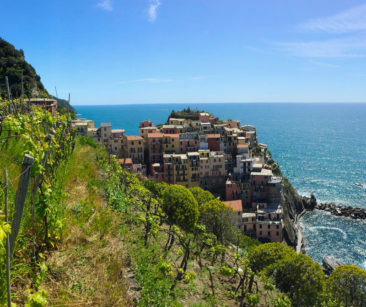 Our first order of business when we arrived was to climb the hills as far up as we could possibly go in order to see the absolute best panoramas and photo locations for Cinque Terre. We thought once we took a few photos we would pick a nice restaurant and relax for a bit. Instead, we lasted about five minutes because I couldn’t bear the thought of moving one more inch in any direction that wasn’t taking me directly to pasta. We ended up grabbing a table at the first restaurant we came across, Il Porticciolo, which was a good thing in our case. We shared delicious pesto bruschetta, and Adam loved his pizza just as much as I loved my spaghetti with clams. Full of carbs, we were ready to tackle an afternoon of hiking. Cinque Terre is connected by both train and walking trails that weave throughout the towns high above the sea. 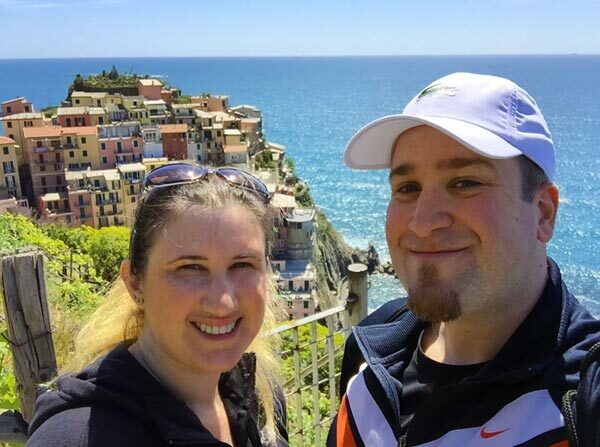 While we didn’t intend to spend a lot of time hiking, we didn’t mind the cardio workout that would lead us to where the best Cinque Terre photos could be taken. The entrance to the trails weren’t particularly well marked; we found one almost by accident as we walked up a street that looked as if it might turn into a dead end at any point. Instead, the road gave way to a beautiful path lined with big trees and, at times, steep staircases that were a little challenging under the hot sun. The uphill climb was pretty constant, so with a couple of breaks to “take pictures” (read: catch our breath) it only took about fifteen minutes before we were walking single file toward a gorgeous spot that provided the exact image I had in my mind when I pictured Cinque Terre before we got there. In addition to the famous rainbow of houses and the shining sea surrounding them, we marveled at the many grape vines that were planted into the steep hillside (perfect for irrigation, we would learn later in our trip, but slightly precarious as we looked down at them from our stopping point). Even higher above us we saw how the path would wind through the highest parts of the hills, and we wished we had allocated more time so we could have made the climb. Instead, we trekked back to where we had started (the walk down was only slightly easier- steep stairs are tough from either direction!). 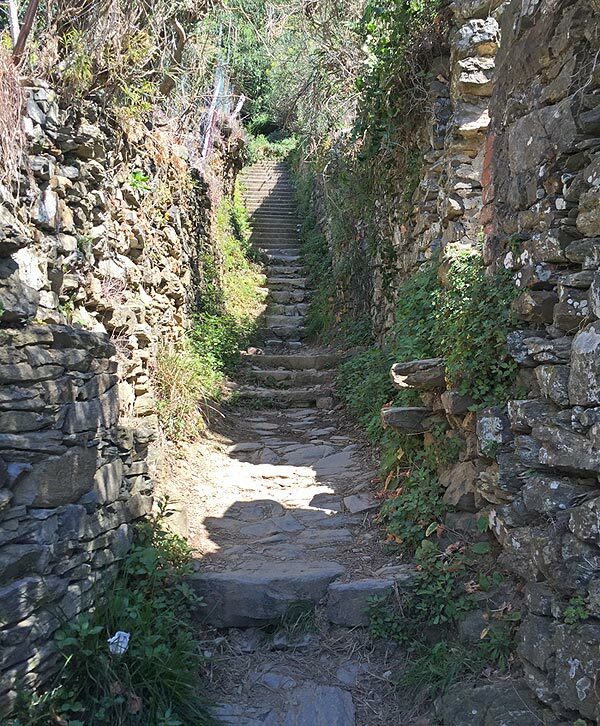 Manarola has lots of great paths to explore, and we spent a good amount of time walking many of them. We wandered by shops and restaurants, past a small park area, down beautiful streets lined with cheerfully painted homes, and eventually wound up at another lovely viewing point where we joined dozens of other travelers as we took photos. Although we had seen what we intended to see, we weren’t ready to leave yet, so we followed another path that wound its way to Nessun Dorma, a restaurant where we thought we might have a quick drink before heading back to the train station. 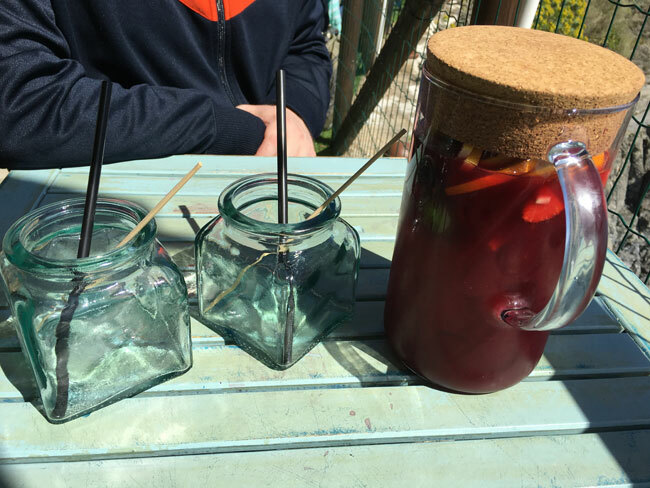 A single drink quickly escalated to a pitcher of some of the best sangria we have ever had; we were on vacation after all! 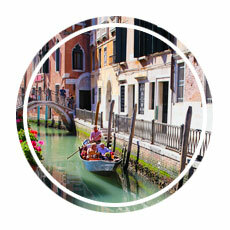 The trips we take are often hectic, meticulously planned, and packed to the brim with things to do. Because we have a limited amount of time each year to explore the world, we don’t mind filling every waking moment we have with new experiences and sights. Our afternoon in Manarola Cinque Terre was a bit of a departure from our usual days on the road. We sat for almost two hours and sipped our sangria. We gazed at the beautiful coast and listened to the waves lap the rocks below us. We acknowledged that we weren’t sure when we would make it back there and how nice it was to just live in that moment. We were a bit wistful when we finally paid our bill and headed off to the train station, wishing we had a little while longer to enjoy in that beautiful place. As it turned out, we did have some more time; there was an accident that delayed our train for more than 30 minutes, which gave us some extra time to enjoy the view of the Ligurian Sea (granted, it was from the crowded train platform, but that didn’t really bother us- I mean, we could have been in front of our laptops instead). Once the train arrived, our trip back to Florence was uneventful, and after a full day of exploring, great food, and sea air, we slept really well. 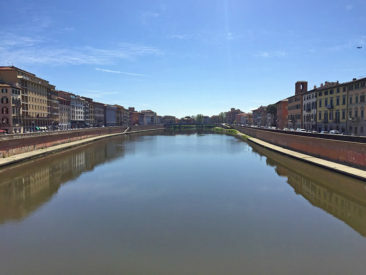 If Tuscany is in your travel plans, a day trip from Florence to both Pisa and Cinque Terre is absolutely possible if you don’t mind spending a good amount of time on regional trains and lots of walking. 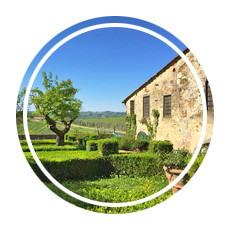 Expect to spend at least 12 hours away from Florence; we recommend leaving between 7 AM and 8 AM, which will give you enough time for a great day trip and put you back in the city for dinner. We bought our train tickets as we needed them- we didn’t buy a round trip ticket because we weren’t entirely sure how long we would spend at each location, so we didn’t want to have to worry about missing a train if we needed some more time. We bought our first ticket from Firenze Santa Maria Novella to Pisa Centrale about 10 minutes before the train left. 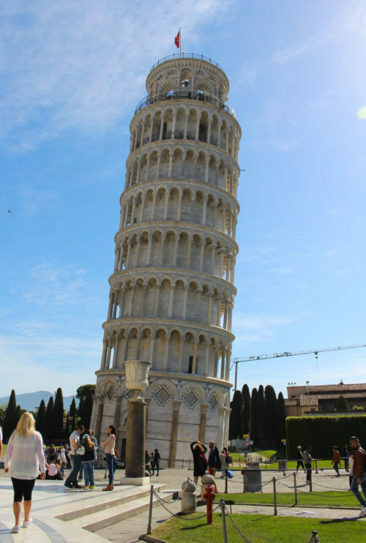 The train ride is about an hour in length, and Pisa Centrale is about a 15-20 minute walk from the Leaning Tower of Pisa and other sights. Just follow the crowds- there were maps of the city on the route, but we found it easier to just follow the big groups who were headed in the right direction! When you travel from Pisa to Manarola, you will leave from Pisa Centrale but will need to transfer at the La Spezia Centrale station. 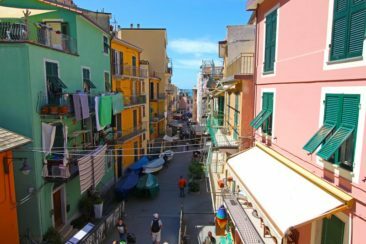 There is a regional train just for Cinque Terre (it starts at La Spezia Centrale and stops at each of the five towns before returning back). The train is easy to find, and you should be able to match the train number on your ticket to the train that is heading to Cinque Terre. The ride from Pisa to La Spezia Centrale is about an hour and a half long, and the second train to Manarola takes only 10 minutes. When you return to Florence, you will have two options depending on your timing: you can leave Manarola, get off the train at La Spezia Centrale, and take a train directly back to Florence, or you may need to go through Pisa again (Manarola – La Spezia Centrale – Pisa Centrale – Firenze Santa Maria Novella). Again, you can purchase your ticket back to Florence at the Manarola train station, so you don’t need to worry much about pre-planning. The last train leaves around 6 PM, although you should check the schedules for the day of travel just to be sure. We knew as soon as we added Florence to our itinerary that we wanted to see both the Leaning Tower of Pisa and Manarola- one of the five coastal towns that make up Cinque Terre. We even went so far as to find a couple of tours that would take us to both in one day. In this case, though, we would recommend against using a tour company. The tours we considered would have cost more than $100 USD per person and primarily included transportation and some brief guided tours. We spent just $35 USD per person, which was a huge savings for us. Taking the planning into our own hands also allowed us to set our schedule for the day. Most tours from Florence provided two hours in Pisa and two or three hours in Cinque Terre; we only took one hour in Pisa but spent way more time than we expected in Manarola, and we enjoyed our time much more knowing we didn’t have to keep checking our watches so we wouldn’t miss our tour group. 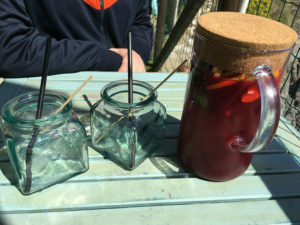 Our relaxing sangria by the water was made possible because we set off on our day trip on our own. Florence was the starting point for our day exploring Pisa and Cinque Terre and we stayed at the Cosimo de Medici. The hotel is in a terrific location, just a three-minute walk from Firenze SMN (the main train station). The train access was a big reason why we selected this hotel and it was very convenient for our day trip to Pisa and Cinque Terre. 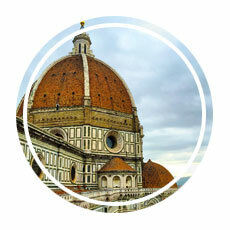 It’s also a quick walk to many tourist attractions in Florence. Our day trip to Pisa and Manarola from Florence was filled with beautiful architecture, incredible landscapes, and delicious food- and it was way too short. We left a lot of great experiences like seeing more of Pisa and visiting the other towns in Cinque Terre on the table, and we’re looking forward to returning someday for a more extended visit.